Three reasons why stomach sleeping is bad for you, particularly if you are overweight or pregnant. Sleeping on your stomach can lead to neck pain or back pain, and here are some reasons why. Here are 3 reasons why stomach sleeping is bad for you. Sleeping on your stomach is the least healthy of the possible sleeping positions. There are several reasons for this, although stomach sleeping does offer some benefits. That said, most people go to bed without giving much thought to their sleeping position. You likely have a regular position for sleeping that you don’t think about – that’s how you sleep and what of it? It’s never done you any harm – or has it? How do you know? Maybe that neck pain you have is because of the way you sleep. You might look in the mirror and see your skin seems to be getting a bit wrinkly – but that has nothing to do with how you sleep! Or has it? Here are three reasons why stomach sleeping is bad for you. First, the negative aspects of sleeping on your stomach. Many people believe that their spine runs in a straight line from the top of their neck right down to the bottom bone, the coccyx. It does so when viewed from the front or back, but not from the side. 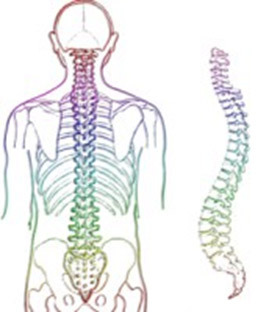 As you can see from the diagram, your spine runs straight down without any lateral movement. However, when viewed from the side, you can see that it has a natural curvature. One reason why stomach sleeping is bad for you is that you cannot lie face down on your pillow. When sleeping on your back, you lie with the back of your head on the pillow. When sleeping on your stomach, you have to turn your head to one side so you can breathe. That means you are sleeping with your neck in an unnatural position – twisted to the side. Test Yourself: Stand or sit up straight, then twist your head to the side. How far can it go, and do you feel pressure on your neck bones or muscles? Yes, you probably do! That’s what’s happening to your neck when you sleep for 6-8 hours every night. That’s why stomach sleepers often suffer neck pain. Back and side sleepers have no such problems. An even worse issue with your neck could be a herniated disk. The individual vertebrae are separated by a gelatinous disk – if this disk ruptures (herniates) it can cause considerable pain. Stomach sleeping exerts various unnatural pressures on your cervical (neck) vertebrae that can force them out of their normal position in either of the above images. If you suffer neck pain, there are cervical pillows available to help reduce this. The middle part of your body holds most of your weight. When sleeping on your stomach, this weight can pull down on your spine. It is difficult for your body to maintain its natural spine shape when your weight is supported mainly by your chest and stomach. By pulling your spine out of its natural shape, you can put pressure on the spinal cord and other sensitive regions of your body. When you suffer pain during the night you might often wake so you will feel less alert each morning. You might not remember waking up for a short while, but your body and brain could suffer because of it. Keep in mind that all the functions of your body below the neck can be affected by a disruption in the shape of your spine. If any part of your body is numb or tingling when you wake up then this is the likely cause. If you are overweight, then it is best not to sleep on your stomach. The extra weight will pull down on your spine and possible move it out of its correct alignment. If that happens you will feel pain. It takes time to correct slipped disks or displaced vertebrae, and all that time you are likely to be in pain. Sleeping on your back or your side is generally the better option. A woman in the later stages of pregnancy would likely not consider sleeping on her stomach. However, some do so in the earlier stages even though it may not be a good idea to do so. As your weight increases, then the pressure pulling down on your spine also increases. This can lead to back pain and disturbed sleep. Pregnancy involves the need for good sleep and rest, and apart from the effect on the mother, acute back pain is also bad for the baby. Stomach sleeping gives the growing baby less room to move and develop. A paper published in the BioMed Pregnancy Childbirth journal in 2012 studied the effects of sleeping on their back and both sides on pregnant women. Stomach sleeping was not considered due to its unsuitability during pregnancy. The study indicated that the best sleeping position for a pregnant woman is on her left side. This position increases a healthy flow of blood providing more oxygen to mother and child. One of the main reasons why stomach sleeping is bad for you is that it can cause serious neck pain. The Mayo Clinic supports this, stating that you place a great strain on your back and your spine when you sleep this way. The best sleeping position appears to be on your left side or your back. Pregnant women should not sleep on their stomach. When I’m not learning about sleep, you can find me hanging out with passionate and open-minded people.